As of game update 5.9.3: Fame and Fortune, critical hits can now be shielded against in PvP. This does not change my gearing recommendations. The negligible improvement to tanks’ survivability gained by stacking Shield Rating and Absorb Rating is not worth the DPS loss (except in select cases where you expect to be tank tunneled). 2018-12-06 Minor edits to reflect that critical hits can be shielded against in PvP as of game update 5.9.3. Layout/visual improvements throughout. 2018-05-14 Updated to reflect changes to Immortal, Darkness and Shield Tech (and their respective Republic mirror) disciplines as of game update 5.9. 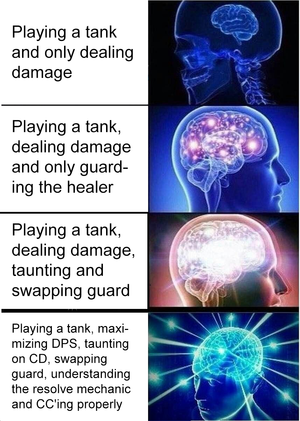 A tank is a support-DPS hybrid whose main job is to reduce the enemy team’s outgoing damage by using taunts, mitigating burst damage with timely Guard swaps and helping to peel and/or control enemy healers and DPS. Tanks’ secondary objective is to contribute DPS to help secure kills. Good tanks need to recognize and understand other classes’ abilities to effectively mitigate incoming damage. They also need the situational awareness to know which allies to Guard and when. PvP tanking has a high skill ceiling. The challenge lies in maximizing damage output while reducing incoming damage from the enemy team as much as possible. Three classes (per faction) have tank disciplines. Accuracy Rating Tank disciplines gain 10% Accuracy. Additional Accuracy Rating is not necessary. Defense Rating Increases chance to defend against melee- and ranged-type (i.e., “white damage”) attacks. Shield Rating/Absorb Rating All melee- and ranged-type attacks and Force- and tech-type attacks which cause kinetic or energy damage can be shielded against. Attacks that cause internal or elemental damage cannot be shielded against. Critical Rating Increases Critical Chance and Critical Multiplier. Alacrity Rating Decreases GCD, channel and cast times, internal CDs and increases resource regeneration rate. Mastery Increases Bonus Damage and Critical Chance. Slightly better than Power for DPS. A strong offense is a good defense. The current PvP “meta” is for tanks to gear for maximum DPS as opposed to mitigation (stacking Critical Rating, etc., instead of Shield Rating, etc.) and to equip DPS relics. 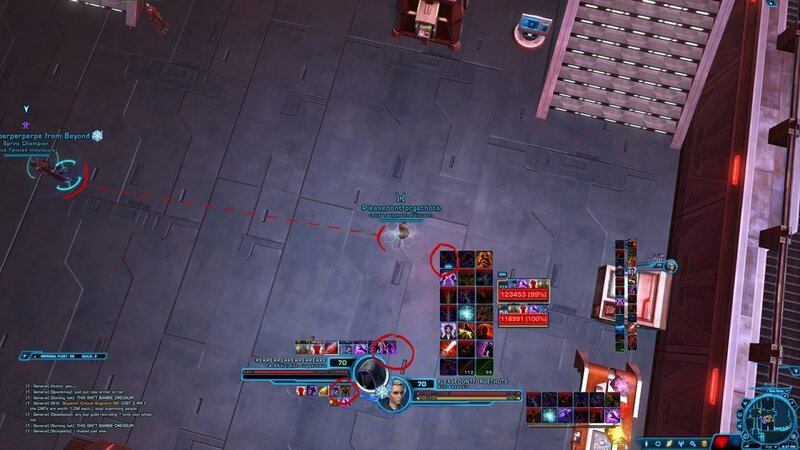 For an in-depth look at stats and damage calculation in SWTOR, see our recent guide. 2-piece Crushing Blow or Guardian Slash increases damage reduction by 2% for 4 seconds. 4-piece Force Scream or Blade Storm reduces the cooldown of Taunt and Challenging Call or Threatening Scream by 2 seconds per activation. 6-piece Increases the duration of Blade Turning by 3 seconds, and the duration of Invincible or Warding Call by 5 seconds. 2-piece Wither or Slow Time increases damage reduction by 2% for 3 seconds. 4-piece Wither or Slow Time reduces the cooldown of Mind Control and Mass Mind Control by 2 seconds per activation. 6-piece Deflection’s duration is increased by 3 seconds and its cooldown is reduced by 10 seconds. 2-piece Heat Blast or Energy Blast increases damage reduction by 2% for 5 seconds. 4-piece While Ion Gas Cylinder or Ion Cell is active, Rocket Punch or Stockstrike reduce the cooldowns of Neural Dart and Sonic Missile or Neural Jolt and Sonic Round by 2 seconds. 6-piece Increases the duration of Oil Slick or Riot Gas by 3 seconds and the duration of Energy Shield or Reactive Shield by 4 seconds. Because Maul and Spinning Strike can be used by all Assassin and Shadow disciplines, Assassins and Shadows can opt to equip Stalker armorings instead. 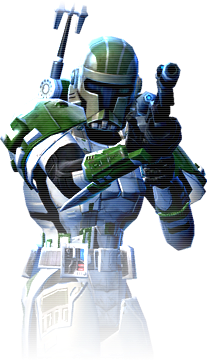 The Stalker 6-piece set bonus makes Maul or Spinning Strike critically hit when certain conditions are met. Juggernauts and Powertechs (and their Republic counterparts) don’t have this option: their autocrit set bonuses are tied to abilities exclusive to DPS disciplines. Always make sure you have a shield equipped in your offhand slot. This will markedly increase your survivability at a small cost to your damage output. You cannot shield against incoming attacks with a focus or generator (DPS offhands) equipped—only with a shield. Tanks also have useful abilities that are triggered by shielding against attacks, as follows. Parrying, deflecting, shielding against or resisting an attack has a 50% chance to grant Revenge (Courage), reducing the rage/focus consumed by your next Force Scream (Blade Storm) or Vicious Throw (Dispatch) by 1. Heat Screen (Power Screen) stacks are generated by shielding against attacks or triggering Ion Gas Cylinder (Ion Cell). Whenever you shield against, parry or deflect an attack, you recover 2% of your maximum Force, your next (Force Breach) does 75% more damage and the active cooldown of Force Shroud (Resilience) is decreased by 1 second. Additionally, shielding against an attack with Dark Ward (Kinetic Ward) active restores a charge and increases its active duration by 1 second. Powertech and Vanguard shields carry an intrinsic amount of Tech Power while Assassin, Shadow, Juggernaut and Guardian shields carry Force Power. Guard is the most powerful ability in the tank’s kit. Guarded teammates are undesirable targets for enemy DPS. You do not need to be within line of sight of your intended target to cast Guard. Allies still benefit from Guard even if you are are out of line of sight, as long as you are within 15m (Guard’s effective range). You can neither Guard a player who has Guard on another target nor can you Guard a target if you are being guarded. If you Guard a tank, it will prevent them from guarding a target. Do not Guard other tanks unless strategically necessary. If you insist on leaving your location and your guarded target, do them a favor and deactivate Guard. This lets other players Guard them while you are away. Guard does not drop off even if you are across the map: that player will still have your Guard but will not benefit from damage redirection. Further, others will not be able to Guard them unless you drop your Guard or they click off your Guard icon in their buff tray. Guarded targets benefit from 50% damage redirection when they are within 15m of their tank. Outside 15m, the guarded target benefits from 5% damage reduction only. In PvP, threat reduction is irrelevant. Note that you can cast Guard up to 30m away but its effective range (where damage is transferred) is 15m. If you’re 15–30m away from an ally in trouble, you can cast Guard as you approach them so they benefit from its damage transfer as soon as you are within 15m. Fig. 3: Active and inactive Guard. It’s easy to accidentally double-click Guard: deactivating Guard won’t trigger the global cooldown (though you can't deactivate Guard during the global cooldown). Keep an eye out for the big blue bubble around the target you are guarding, check your action bar to make sure Guard is active (it should be lit up, as shown in Fig. 3) and check your buff tray/your ally’s buff tray to confirm. You can parry melee and ranged attacks against your guarded target. 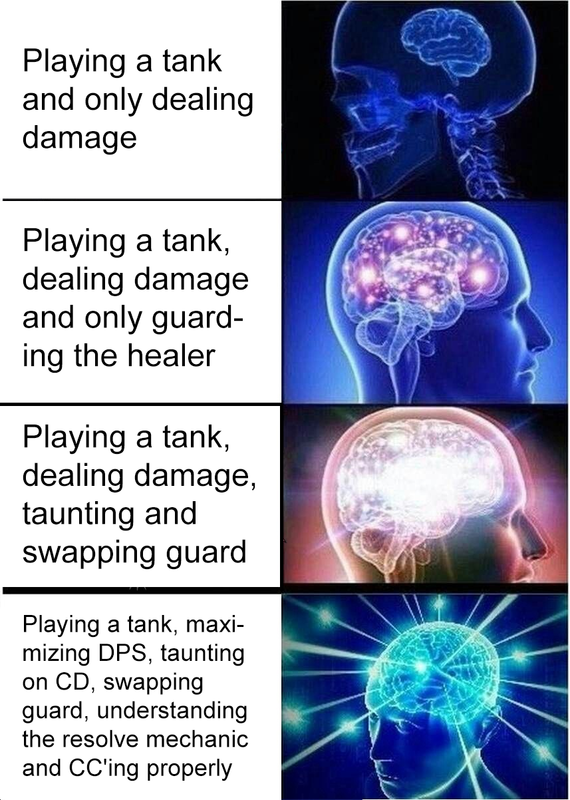 Taunting is extremely important for tanks (as well as for DPS who have this ability). When a character is taunted, their attacks against anyone other than the caster temporarily deal 30% less damage. Taunts are normally on short cooldowns: use them often. Every advanced class with a tanking discipline (Powertechs, Juggernauts, Assassins and their Republic counterparts) has one single-target taunt and one AoE taunt. Never single-target taunt healers: it doesn’t reduce their healing output and their DPS is negligible. Prioritize taunting those enemies doing the most damage. This will reduce their DPS and maximize the value of your taunts. The 4-piece set bonus for each tanking set (War Leader, Survivor and Supercommando) causes an ability—Force Scream (Blade Storm), Wither (Slow Time) and Rocket Punch (Stockstrike) respectively—to reduce the active cooldowns of both single-target and AoE taunts by 2 seconds. In the post-match statistics, all the damage you prevented with taunts and redirected via Guard counts towards your Protection score. The better you are at taunting the right targets on cooldown and rotating your Guard to mitigate as much damage as possible, the higher this number will be. Every discipline in SWTOR has at least one hard stun and one mez (except Powertechs/Vanguards, who have an AoE hard stun instead of a mez). Learn the difference between hard stuns, which are stuns lasting 2–4 seconds that do not break on damage, and mezzes, stuns lasting 6–8 seconds which do break on damage. When you are mezzing a player in hopes of stopping them from casting or helping a teammate escape, try not to break your own mez! Also note that teammates can break your mezzes. For example, if the target you want to CC has DoTs on them, any mez will be broken as soon as the DoT ticks. In this instance, it's better to hard stun the target. Be aware that hard stuns and mezzes build resolve. You cannot CC targets indefinitely: chaining CCs on a target fills their resolve bar, turning it white and granting them temporary immunity to mezzes and hard stuns. Learning the basics of the resolve system will help you improve as a support player. I would advise studying the Resolve chapter of Ne’laa’s excellent guide to PvP. The Enhanced Paralytics (Paralytic Augs) utility increases the stun durations of Electro Dart (Cryo Grenade) by 1 second and Carbonize (Neural Surge) by 0.5 seconds. The Shroud of Darkness (Mental Fortitude) passive enables tanks to use Spike (Spinning Kick) out of stealth. The Haunted Dreams (Containment) utility enables Assassins/Shadows to cast Whirlwind (Force Lift) instantly. Additionally, if Whirlwind (Force Lift) is broken early by damage, the target is stunned for 2 seconds. Pooled Hatred Whenever your movement is impaired, you gain a 10% damage bonus to your next ability that consumes rage. This effect can stack up to 5 times and lasts 15 seconds. Gather Strength Whenever your movement is impaired, you gain a 10% damage bonus to your next ability that consumes focus. This effect can stack up to 5 times and lasts 15 seconds. Defection Mounting Darkness is a Darkness passive which turns Deflection into an 8-meter AoE aura centered on the caster. Enemies within its radius deal 15% less Force and tech damage for 12 seconds (or 15 seconds with the Survivor 6-piece set bonus, which also reduces its cooldown by 10 seconds). Overload Conal AoE knockback. The Electric Bindings utility causes targets to be rooted. Fig. 7: Assassin’s Deflection/Mounting Darkness animation. Disjunction Increases the durations of Force Shroud by 2 seconds and Force Speed by 0.5 seconds. Additionally, Force Speed slows all enemies within 5 meters by 75% for 2.5 seconds when activated. Double Strike for filler when waiting for Slow Time or Project to come back up and Shadow Strike isn’t proc’d. Double Strike also applies Trauma, reducing targets’ healing received by 20%. Slow Time and Project proc Harnessed Shadows (stacks up to 3 times), which makes Cascading Debris uninterruptible and immune to pushback. Additionally, each stack increases the damage of the next Cascading Debris by 15%. Spinning Strike on cooldown if a target is in execute range. When proc’d (by shielding against, parrying and deflecting attacks), use Force Breach for maximum cleave. Only Whirling Blow when you see a good cleave opportunity; it applies the Trauma debuff (20% decreased healing received) and procs Shadow Strike/Project. Out of Force? Saber Strike. Deflection: Pulsating Force is a Kinetic Combat passive which turns Deflection into an 8-meter AoE aura centered on the caster. Enemies within its radius deal 15% less Force and tech damage for 12 seconds (or 15 seconds with the Survivor 6-piece set bonus, which also reduces its cooldown by 10 seconds). Fig. 8: Shadow’s Deflection/Pulsating Force animation (credit: Valek). Shadow Stride: Instantly teleport to an enemy target. Can be used to get back into Guard range or CC an incoming enemy. Does not break stealth. Force Speed: The One with the Shadows utility causes Force Speed to grant 60% damage reduction for its duration. Use to mitigate burst damage directed at you or your guarded target. Use on cooldown when under heavy fire. Force Potency: As well as being a powerful offensive cooldown, Force Potency additionally grants 30% shield absorption for 20 seconds (via the Mental Fortitude passive). Resilience: Use to purge debuffs, resist big yellow damage and resist stuns. Because of its short, 1-minute cooldown (further reduced by shielding/parrying/deflecting attacks via the Rapid Recovery passive), you can use Resilience liberally. Battle Readiness: Use when you need longer-lasting damage reduction (+25% for the duration via the Shadowsight passive). Make sure not to pop it too early as it also heals you for 15% of your maximum HP on activation. Because it provides flat damage reduction (from all sources), it is particularly useful for mitigating damage taken though Guard. Deflection: Deflection increases your chance to parry melee and ranged attacks by 50% for 12 seconds. Because you can parry melee/ranged attacks against your guarded target, it’s useful when you or your guarded target are taking heavy white damage (e.g., from Marksmanship Snipers). If you or your guarded target are taking heavy yellow damage, use Battle Readiness instead. The debuff (from Pulsating Force) applied to enemies within 15m mitigates single-target yellow damage directed at any of your teammates (not just you and your guarded ally). However, 15% damage reduction is fairly small. Ideally, you will use Deflection when you or your guarded target are under focus fire and you’re in a position to debuff multiple enemies—but you will sometimes be forced to use it for one situation or the other. Note that, because you can’t dodge attacks while hard stunned, this cooldown is especially effective when you have full resolve (are “white-barred”). Force Cloak: Force Cloak has three main uses. Firstly, when you need to disengage from a fight. Secondly, when you need to temporarily reduce pressure on yourself and give your healers breathing room. Note that, in both instances, you first need to deactivate Guard to prevent getting decloaked by Guard damage or (somewhat less importantly) getting stuck in combat. Thirdly, you can also use it at as a second, shorter Resilience. However, you should only do this if you are confident you won't need the cooldown as an escape (as in the first two examples) anytime soon. 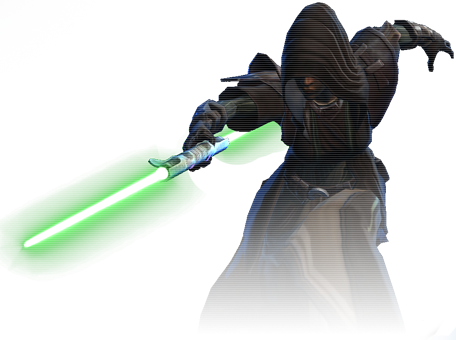 Force Cloak also “resets” your Warzone Medpac, which has a cooldown of 1.5 minutes but also requires you to break combat to use it again. In theory, Shadows can use their medpac every 1.5 minutes with Force Cloak. Firestorm (floats in priority as it’s on internal cooldown—wait for ideal cleave). Flame Sweep: Spammable AoE ability. Applies Trauma debuff (20% less healing received). The Suppressive Tools utility additionally causes Flame Sweep to slow affected targets. Flame Burst: Good single-target damage. Applies Trauma debuff (20% less healing received). Explosive Fuel: Offensive and defensive cooldown, increasing ranged and tech critical hit chance by 25% and defense chance by 35% (via Coolant passive). Shatter Slug: Shouldn’t be used unless without the Mutilating Shards utility (slows affected targets by 75% for 15 seconds). Flame Sweep/Suppressive Tools slow is arguably superior. Deadly Onslaught: Only use if you see a good cleave opportunity. Shoulder Cannon: Use on cooldown. Can also be used while CC’d. Overheated? Use Vent Heat and/or Rapid Shots. Oil Slick is unique to Shield Tech. It reduces the movement speed of all targets within its AoE by 70% and reduces their accuracy by 15%. It lasts 10 seconds (or 13 seconds with the Supercommando 6-piece set bonus) and is hard to miss, leaving a giant pool of oil at its location. It’s particularly effective against melee attackers, who have a hard time escaping it. You can either stand in the AoE or just outside it, forcing melee to trudge through or take the long way around. Fig. 9: Powertech’s Oil Slick animation. Translocate is a cast ability that causes you and a friendly target to swap locations. Translocated allies cannot be leapt to or pulled and are immune to interrupts and pushback for 6 seconds or until they use an aggressive/healing ability. Translocate can be used to quickly get an ally out of a bad position and put you back on the frontline. Does not interrupt targeted ally’s casts. Fig. 10: Powertech’s Translocate animation. Grapple can be used to peel for an ally or move an enemy out of position for a kill. Explosive Fuel: Explosive Fuel is Shield Tech’s go-to defensive cooldown because it doubles as a powerful offensive cooldown (+25% critical hit chance). +35% defense chance not only results in significant damage mitigation (theoretically more than Energy Shield’s +25% damage reduction) but can also resist hard stuns, CCs, slows and other nastiness to boot. Energy Shield: Increases damage reduction by 25% for 15 seconds (or 19 seconds with the Supercommando 6-piece set bonus). Note that this increase is additive, not multiplicative. Use when Explosive Fuel is not available or would be overkill. Kolto Overload: Using Kolto Overload effectively is about judging how low you can safely let your health drop before popping it to maximize its value. Too early and it’s useless to you and your healers; too late and you can easily die through it. If you are being tank tunneled by multiple enemies, err on the side of caution and use it early. If you are getting slowly worn down by Guard damage and/or collateral AoE damage, you can afford to let your health drop more—though observant enemies may take note of your dropping health and swap to you. Hydraulic Overrides: Breaks roots, increases movement speed and grants immunity to movement-controlling effects for the duration. A versatile ability, Hydraulic Overrides enables you to kite, chase down enemies and get back into Guard range. To the left are utilities ranked by usefulness (key below). To the right is a recommended build for typical warzones. When you feel comfortable with the discipline, I encourage you to experiment, to find which utilities complement your playstyle and which are best suited to particular situations, team compositions, etc. Ion Storm (floats in priority as it’s on internal cooldown—wait for ideal cleave). Explosive Surge: Spammable AoE ability. Applies Trauma debuff (20% less healing received). The Entangling Tools utility additionally causes Explosive Surge to slow affected targets. Ion Pulse: Good single-target damage. Applies Trauma debuff (20% less healing received). Battle Focus: Offensive and defensive cooldown, increasing ranged and tech critical hit chance by 25% and defense chance by 35% (via Soldier's Grit passive). Flak Shell: Shouldn’t be used unless without the Smothering Slag utility (slows affected targets by 75% for 15 seconds). Explosive Surge/Entangling Tools slow is arguably superior. Artillery Blitz: Only use if you see a good cleave opportunity. Out of ammo? Use Recharge Cells and/or Hammer Shot. Riot Gas is unique to Shield Specialist. It reduces the movement speed of all targets within its AoE by 70% and reduces their accuracy by 15%. It lasts 10 seconds (or 13 seconds with the Supercommando 6-piece set bonus) and is hard to miss, releasing a canister of red gas at its location. It’s particularly effective against melee attackers, who have a hard time escaping it. You can either stand in the AoE or just outside it, forcing melee to trudge through or take the long way around. Fig. 11: Vanguard’s Riot Gas animation. Transpose is a cast ability that causes you and a friendly target to swap locations. Transposed allies cannot be leapt to or pulled and are immune to interrupts and pushback for 6 seconds or until they use an aggressive/healing ability. Transpose can be used to quickly get an ally out of a bad position and put you back on the frontline. Does not interrupt targeted ally’s casts. Harpoon can be used to peel for an ally or move an enemy out of position for a kill. Battle Focus: Battle Focus is the Shield Specialist’s go-to defensive cooldown because it doubles as a powerful offensive cooldown (+25% critical hit chance). +35% defense chance not only results in significant damage mitigation (theoretically more than Reactive Shield’s +25% damage reduction) but can also resist hard stuns, CCs, slows and other nastiness to boot. Reactive Shield: Increases damage reduction by 25% for 15 seconds (or 19 seconds with the Supercommando 6-piece set bonus). Note that this increase is additive, not multiplicative. Use when Battle Focus is not available or would be overkill. Adrenaline Rush: Using Adrenaline Rush effectively is about judging how low you can safely let your health drop before popping it to maximize its value. Too early and it’s useless to you and your healers; too late and you can easily die through it. If you are being tank tunneled by multiple enemies, err on the side of caution and use it early. If you are getting slowly worn down by Guard damage and/or collateral AoE damage, you can afford to let your health drop more—though observant enemies may take note of your dropping health and swap to you. Hold the Line: Breaks roots, increases movement speed and grants immunity to movement-controlling effects for the duration. A versatile ability, Hold the Line enables you to kite, chase down enemies and get back into Guard range. Tanking is about balance: maximizing your damage output while mitigating as much incoming damage as possible. By Guard swapping; using taunts on CD; understanding the particulars of the resolve system and how to CC effectively; performing the correct rotation; understanding how to best peel for allies; using your DCDs correctly and making sound utility choices, you’re on your way to becoming a valuable member of your team. The skill ceiling is almost limitless: there are always ways to improve. Always aim to advance your game knowledge. Learn to identify dangerous situations and abilities so you can get the most value out of Guard. You need to know who to Guard and when (e.g., an ally who is about to be Ambushed) and when to disable Guard to prevent yourself dying unnecessarily. Developing this level of game sense takes time, effort and a lot of practice. I hope this guide opens your eyes to the complexities of PvP tanking and helps you take your gameplay to the next level. Big thanks to Puddlejumper for his insights and to doc for his major contributions to this article. Thanks also to the teams at TORCommunity and Jedipedia, whose databases were invaluable references in writing this guide. Thanks also to rambol for revising and copyediting the text and for enabling me to share my insights with the community by hosting the guide. Finally, a special shoutout to that one guy in that arena who couldn’t Guard swap. This guide is dedicated to you. I’m known as Hottie on Satele Shan. I have written four comprehensive guides to Operative healing and am a regular contributor here at rambol.net. I am passionate about gaming, PvP and Operative healing in particular. I have thousands of warzones under my belt, as well as hundreds of hours of team and solo ranked. I love to stream my gameplay and give tips to aspiring players. I am also passionate about giving back to the community and run my own SWTOR charity events. With the help of my guildies, friends and the SWTOR community, we have managed to raise thousands of dollars for several charities, including the American Cancer Society and the American Foundation for Suicide Prevention.